2015 was a turbulent year for the Chinese economy. Amidst another long and arduous year of rebalancing the economy away from investment-driven growth towards a more sustainable model, economic growth slowed to 6.9 percent, the lowest rate in decades. Meanwhile, the Chinese stock market lost one-third of its value over a relatively short period of time. Despite these facts, the value of China's top 100 brands rose a robust 13 percent, according to Millward Brown's Brandz Top 100 Most Valuable Chinese Brands 2016 report. The report indicates that the shift to a more consumer-driven economy is happening in a big way. 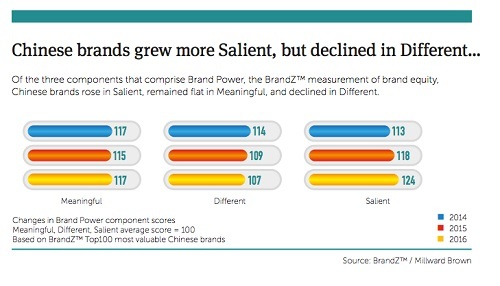 For the past six years, Millward Brown -- a global marketing company, focused on branding, media and communications -- has been publishing the definitive branding report for the Chinese market. This year, it continues its tradition of incredible insights. During 2015, market-driven brands exceeded 50 percent of the top 100 brands' total value for the first time ever. At the same time, half of China's ten most valuable brands are market-driven companies. Tencent, the creator of WeChat, remains the most valuable Chinese brand for the second year in a row. The technology giant increased its brand value by an impressive 24 percent since in the last year. The technology sector as a whole increased from 16 percent of the total value of the top 100 in 2015 to 27 percent this year. Meanwhile, banking and telecoms, two industries dominated by state-owned enterprises, decreased from 50 percent to just 32. These facts further emphasize China's shift towards a more market-driven and sustainable economic future. According to Millard Brown, there are three important components of Brand Power which are used to help measure brand equity. The first is "differentiation", the way that consumers view the brand in some unique way, perhaps as a trendsetter. The second is "meaningfulness" where consumers feel an affinity for the brand. Third is "salience", where consumers think of this brand quickly when a purchasing opportunity arises. Over the past several years, Chinese brands have made a lot of progress becoming more salient than multinational brands. In terms of meaningfulness, Chinese and multinational brands are about even in the minds of Chinese consumers. However, multinational brands still have a significant edge over their Chinese counterparts when it comes to being seen as "different". Out of the 20 dimensions that are used to examine how brands differentiate, the most important characteristics in China are trust, creativity, desirability and wisdom. In light of previous safety scandals, trust is a dimension that is more important for brand managers to build and nurture than anywhere else in Asia (and perhaps the world). China has more than 670 million Internet users, more than double the population of the US. Meanwhile, advertising and marketing communication are evolving differently and more rapidly than in the West. To illustrate this point, about half of all advertising spending in China is spent on digital while just over a third is spent on television. In the US, these numbers are reversed with about 42 percent spend on television and less than a third on digital. Since 2010, digital spending in China has increased by about 450 percent, compared to a 60 percent increase over the same time period in the US. The majority of the digital advertising investment in China is being spent on video. During 2016, spending is expected to increase by 41 percent, an increase of 660 percent over the past five years. However, Chinese consumers are getting frustrated with the growing number of long video ads online. When it comes to digital, brands should try to focus on generating less traditional (like video) content, and more on things such as blogs, WeChat and other social media platform posts, white papers, etc. If engaging in online video, make sure that your content can instantly grab and hold attention (humor is usually the best way to accomplish this). Despite the fluctuations in the stock market and decrease in GDP growth, Chinese consumers remain quite optimistic about the state of the economy. In a survey done at the end of last year that examined the expectations of small investors in China, almost three quarters of respondents felt optimistic about the future of the stock market based on their faith that the government would continue to drive economic growth. The overall level of confidence can be observed in the increased economic activity, especially in the retail sector which grew by 10 percent last year. In 2012, President Xi Jinping described a vision of China that was respected around the world and whose citizens enjoyed great prosperity. He called this vision the Chinese Dream. The Chinese Dream has moved from just being a government slogan and now represents the expectations and hopes of Chinese consumers, especially the younger generations. Chinese consumers are likely to view brands more favorably if they believe the product or service aligns with their view of the Chinese Dream. 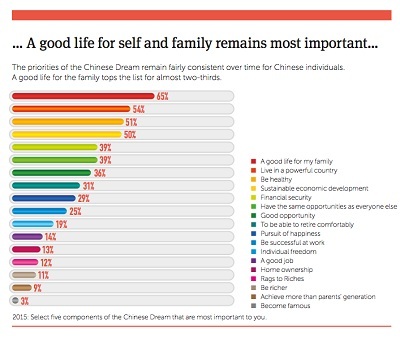 According to one survey, the five most important components of the Chinese Dream include having a good life for one's family, to live in a powerful country, to be healthy, to have sustainable economic development, and financial security. Brands can really benefit if they can align with the Chinese Dream by demonstrating that their mission is not just about profits, but can help Chinese families improve their lives and help the country develop into a stronger, more prosperous and equitable nation. For many years, international brands were desired in China mainly as a status symbol. However, today's more sophisticated Chinese consumers are motivated less by status, and more by quality and safety. Status still plays an important part of the purchasing decision process, particularly in the luxury goods market. The most important attributes that Chinese consumers consider when purchasing a status symbol product include country of origin, history and storytelling. At the same time, shoppers are becoming more comfortable purchasing luxury goods and foreign products on the Internet. Consumers are able to shop with more confidence online having more reassurance that the products they purchase are genuine and can be shipped quickly and at a low price. These shifts in consumer preferences are an opportunity for international brands to more easily reach Chinese consumers across the entire country as consumers in tier-3 and tier-4 cities become more affluent and develop more international tastes.